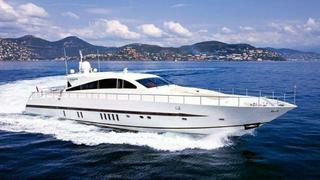 News in overnight from Dan Passaro at Reel Deal Yachts that they've listed the 26.8 metre motor yacht That's Amore for sale. Built by Italy's Arno yard, That's Amore was delivered in 2001 as one of the yard's Leopard 88 series and has low clearance and a shallow draft, making her ideal for cruising in Florida and the Bahamas. A large saloon has comfortable seating, a full home cinema, formal dining area and a gourmet galley. The transom features hot and cold showers for use after diving off the swim platform. Accommodation on the lower deck is for up to nine guests in four staterooms. These consist of a master suite, two doubles and a twin with a Pullman berth - all have LCD Samsung television screens and all have en suite bathroom facilities. That's Amore is powered by twin 1,800hp MTU engines linked to Arneson drives giving her a cruising speed of 24 knots and she was recently refitted with new soft goods, electronics and air conditioning. Lying in Miami, Florida, That's Amore is asking $950,000.